I am a Senior Scientist at Honda Research Institute USA working in robotics, particularly in the intersection of mechanical engineering and computer science. My research interests include humanoid robot control and motion synthesis, physical human-robot interaction, character animation, and human motion simulation. I was a Senior Research Scientist at Disney Research, Pittsburgh and an Adjunct Associate Professor at the Robotics Institute, Carnegie Mellon University from October 2008 to December 2017. I received my B.S., M.S., and Ph.D. degrees in Mechanical Engineering in 1997, 1999, and 2002 respectively from the University of Tokyo, Japan. 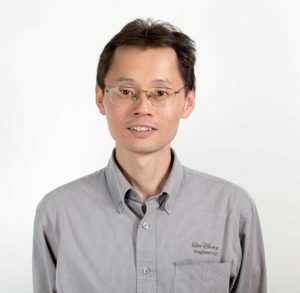 Prior to joining Disney, I was an Associate Professor at the University of Tokyo (April 2003 to September 2008) and a postdoctoral fellow at Carnegie Mellon University (April 2002 to March 2003). I received King-Sun Fu Best Transactions Paper Award and Early Academic Career Award from IEEE Robotics and Automation Society, and Young Scientist Award from Ministry of Education, Japan. Please see the robotics page and my LinkedIn profile for more information on my work. Outside of robotics, I enjoy traveling around the world and conducting an orchestra.